Saving Private Ryan film set at Curracloe Beach Wexford - The Trading Post Camping & Caravan Park, Wexford. 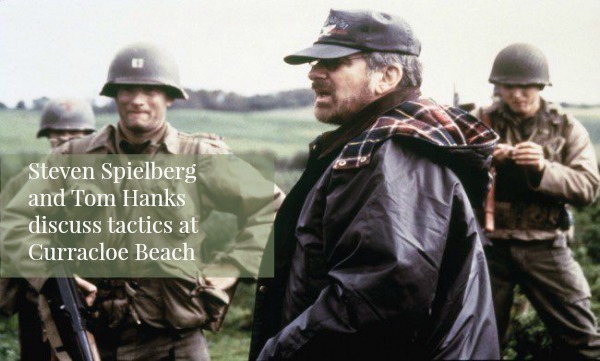 Spielberg went to great lengths to ensure that the film was as true to life as possible. This included using 1000 real weapons amongst 500 fake ones. All of them had to be cleaned of sand every night. Curracloe Beach was rigged with explosives with stuntmen located nearby. Forty thousand gallons of fake blood were used. A reported $12 million of the $65 million budget went on the scene at Curracloe. Spielberg hadn’t wanted the film to romanticise World War II but rather to tell the truth of the horror of it which the opening scenes at Curraghcloe certainly did. He also made the actors do a 6 day bootcamp in preparation for the film. Real soldiers do 4 months and he wanted to ensure that they knew how to strip down and clean guns, hold a weapon etc. The film later went on to win 5 Oscars. Curracloe beach is one of the cleanest beaches on the Irish coast and is a blue flag beach. It is just a 15 minute drive from Wexford Town.